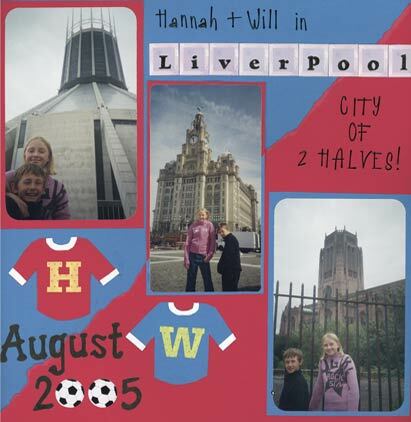 A Liverpool scrapbook layout may not seem like an obvious choice for any scrapbookers except die-hard Beatles fans, but last time I visited I felt a layout coming on! I decided to create a divided page about Liverpool, and that a torn paper edge would reflect the city's spirit more than a neatly-drawn diagonal. After all, this isn't Eastbourne we're talking about! I had quite a clear idea before I started of what I wanted this page to look like - very unusual for me! What I've discovered since is a book that has taught me how to use a sketch template to map out the layout beforehand. The results can be great - without the changes of mind and 'U-turns'. Jen Gormley's '500 Scrapbooking Sketches' contains templates that we can use for many different layouts. In fact if you scroll half way down this page you'll see a great example of a simple line drawing 'morphing' into a really classy layout. Liverpool is all about red (Liverpool) and blue (Everton) football clubs, so I used a football shirt template in colours contrasting with their backgrounds. I also used alternate colours to mat my photos. I found some decent lettering for this page in a Sassafras Lass page kit (for 'winter'!). The rub-on transfer lettering from Colourcraft didn't adhere too well to be honest. I had to reinforce with a journaling pen. I felt the layout needed a focal point that transcended the idea of division - because Liverpool is very 'together' when it has to be. I thought the famous Liver Building was the best bet, and I still do. Besides, '3' is as good a number of photos for a Liverpool layout as it is for any other page. Well, I'm a Beatles fan and I'd love to put a black disc with 'Parlophone' on it to really complete my Liverpool scrapbook layout. Mind you, I wouldn't dream of posting that on the web. I'd need more than a little help from my friends! COULD I BUILD MY OWN WEBSITE? or 'Solo Build It!' - and it all started falling into place. I've never come across such a supportive and success-oriented group of people as the unique 'community' of fellow 'SBIers' who will share their advice and experiences for free.